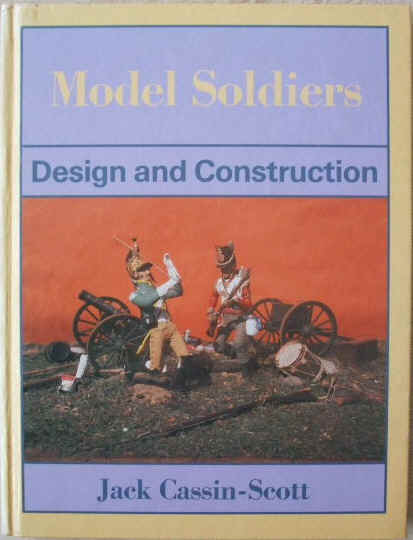 First UK edition, first print hardback of MODEL SOLDIERS Design and Construction, by Jack Cassin-Scott and published by B. T. Batsford Ltd., London, in 1990. The book is in very good condition (Clean laminated pictorial boards) with only minor wear to the boards (minor bumping to the spine edges and to some of the corners). There is very slight fading to the spine. No dust jacket as issued? (Publisher's price sticker at the back). Internally, the pages are clean and tight and there are no tears and no inscriptions. Model Soldiers have long held a fascination for military and model-making enthusiasts alike. Here is the chance to make your own models, individually tailored to suit every requirement. Jack Cassin-Scott uses his many years' experience to provide a straightforward and practical guide to all the basic modelling and casting techniques. There are useful tips on creating accurate replicas of specific historical and contemporary military figures, and information on how to convert model kits for special purposes. Chapters include General principles, Model kits, Modelling a figure, Moulds, Casting, Equipment, Horses, Painting and Dioramas. With clear diagrams and step-by-step photographs throughout, Model Soldiers is an essential guide for all model-making enthusiasts. 96 pages. Illustrated throughout with colour and black & white photographs and line drawings.